In this monthly blog series, our collections team write about their Object of the Month, chosen from our collection. 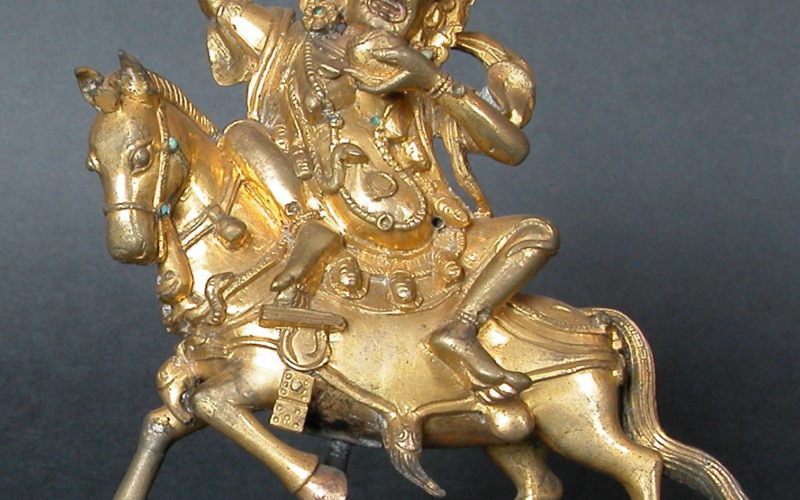 This miniature gilt-bronze statue is an example of a Tibetan ‘wrathful guardian’. It depicts Palden Lha-Mo, also known in Sanskrit as Shri Deva, the Great Goddess. She is a member of the ‘Eight Guardians of the Law’ or the Dharmapala. Her fierce appearance is intended to scare away evil rather than the Buddhist practitioners who would have viewed this statue. 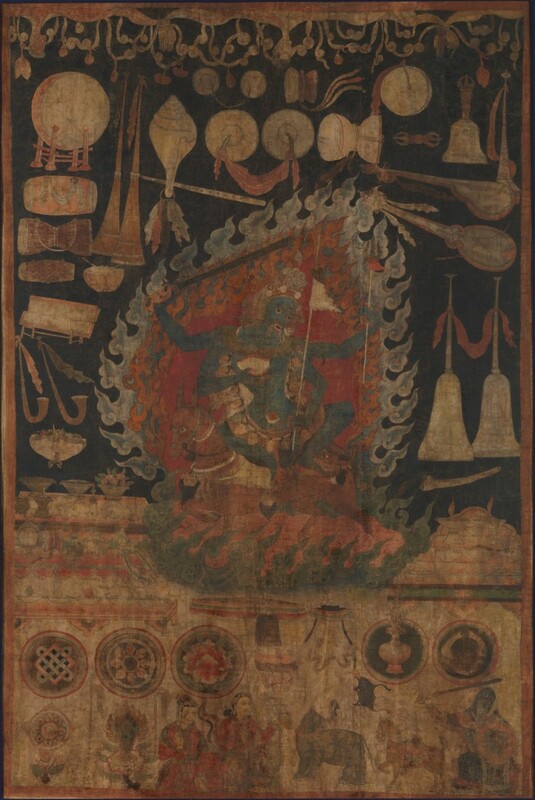 Most depictions of the Dharmapala share similar frightening elements such as the angry expression, the necklace or crown of skulls, and flame-like hair or a halo. Palden Lha-Mo is the only female Dharmapala. She is known as a compassionate protector of those who follow the Dharma, or Buddhist law. As with all Buddhist statues, each aspect of this image of Palden Lha-Mo has a meaning. The symbols in this object mainly refer to the legend of Palden Lha-Mo’s life and transformation into a wrathful guardian. According to this legend, she was once married to an evil King of a kingdom called Lanka, who was an enemy of the Dharma and used to murder his subjects. The King was bringing up their son to be the ultimate destroyer of Buddhism. She vowed to either lead her husband to a more compassionate Buddhist life. She tried for many years to convert her husband, but was unsuccessful, and so decided that her only alternative was to end his dynasty. She killed her son, took his skin for a saddle for her horse, and his skull for a cup. As she was riding away, the King fired an arrow which struck her horse. Seeing this, she said ‘May this wound become an eye to watch over the twenty-four regions, and may I be the one to end the lineage of the malignant kings of Lanka’. If you look closely at this miniature statue, you can see the eye by the horses’ tail, and you can spot the skull cup that she is holding. Her other hand is raised in the harina mudra or ‘lion gesture’, and is likely to have originally held a club. She is often depicted as riding her horse across a sea of blood which represents the cycle of death and rebirth. This symbolises her ability to liberate people from that cycle. Palden Lha-Mo is believed to be the protector of Tibet and the Dalai Lama. Legend tells that she is the guardian of ‘the Oracle Lake’ or ‘Lhamo La-tso’, which lies to the Southeast of Lhasa in Tibet. It was at this lake that Palden Lha-Mo is said to have promised the first Dalai Lama that she would protect his lineage. Rulers and important Lamas (monks) have traditionally visited this lake in order to discover through visions who the next reincarnation of the Dalai Lama would be. 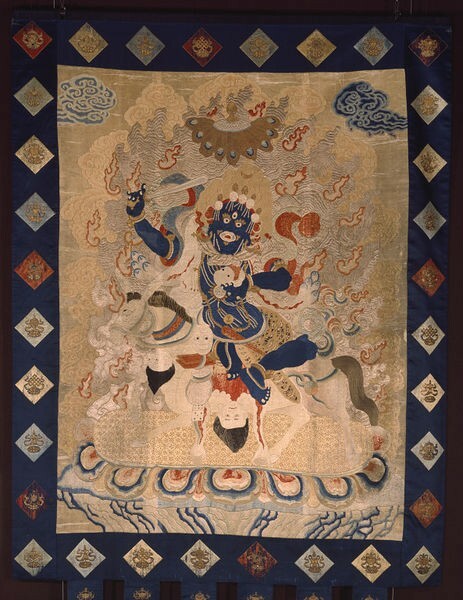 Palden Lha-Mo’s image is considered to be so powerful that it is often covered over in monasteries and temples. The idea that Buddhist statues are powerful is very important. Before a statue is placed on an altar, a consecration ceremony is performed. This may include placing sacred objects such as relics and prayer scrolls inside the statue. Once this is complete, the statue is considered to be inhabited by the deity. It cannot be moved, it is treated with great care and respect, and offerings are given to it. The painting below outlines the kind of offerings that are presented to Palden Lha-Mo, including musical instruments to represent music offerings, and images of food, flowers, and lamps. Due to the small size of this statue, it is likely that it was used as a personal protection charm rather than permanently placed on an altar. The fact that it doesn’t have a base (the wooden stand is modern and was created for the purpose of displaying the statue) also suggests that it was made to be portable. 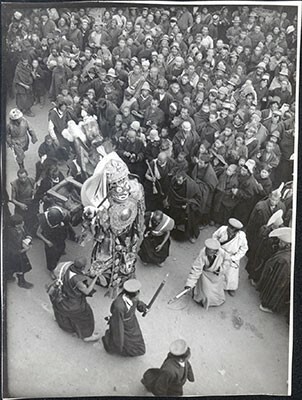 Ordinarily a statue of Palden Lha-Mo would include a lotus petal base or one depicting a sea of blood. It is gilded and has inlaid turquoise, which suggests that it would have been commissioned by or made for someone wealthy. Charms such as miniature deity statues were often carried in charm boxes, which would have been worn across the chest or around the waist. 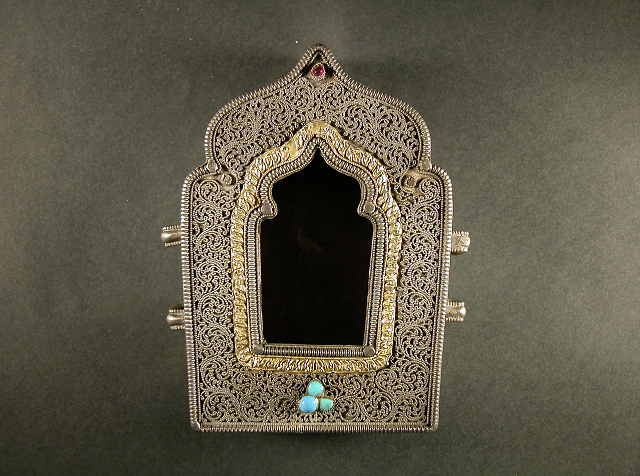 There is an example of a charm box on display in the Buddhist Room here at the Castle. 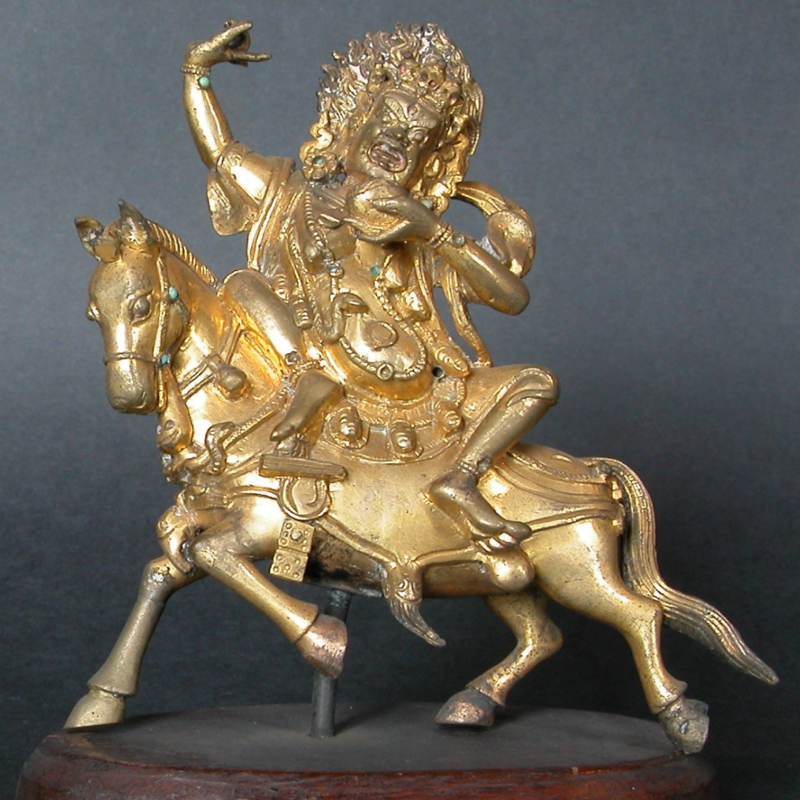 A Buddhist practitioner may have carried this statue with them in order to ward off evil. People also would have commissioned and paid for the creation of statues as an offering to a certain deity, and as a way to accumulate merit. The accumulation of merit is a key focus for Buddhists, as it is believed that committing good deeds will increase the chance of being reborn into a good life. This object is just one of the many objects that form part of Denys Eyre Bower’s five impressive collections which include Ancient Egyptian, Japanese, Buddhist, Stuart and Jacobite, and Books. For more information on these objects, review our Object of the Month series, visit the Historic House and Collections or contact our Curator, Naomi Collick by email or by calling 01892 870347.